Clarinet Sonatas By Johannes Brahms (1833-1897). Edited by Heinrich Bading and Carl Herrmann. For Bb clarinet (or viola) and piano. Classical Period. Difficulty: medium to medium-difficult. Set of performance parts (viola part included). Solo part and piano accompaniment. 50 Selected Songs - Low Voice "(Low Voice). By Franz Schubert (1797-1828), Robert Schumann, Johannes Brahms (1833-1897), Hugo Wolf (1860-1903), and Richard Strauss (1864-1949). Edited by Florence Easton. For low voice and piano. Vocal Collection. Classical Period. Difficulty: medium. "Klavier Quintett (Piano Quintet), Op. 34 in F Minor" "By Johannes Brahms (1833-1897). For piano quintet (2 violins, viola, cello, piano). Classical Period. Difficulty: medium-difficult. Set of performance parts. Standard notation. Op. 34. 112 pages. Published by Edition Peters"
2 Rhapsodies Op. 79 "(Piano Solo). 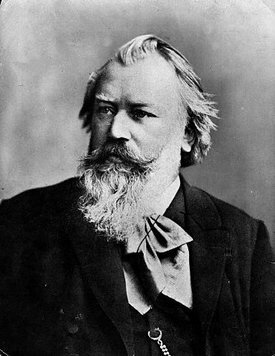 By Johannes Brahms (1833-1897). Edited by Monica Steegmann. For piano solo. Piano (Harpsichord), 2-hands. Henle Music Folios. Pages: 19. SMP Level 10 (Advanced). Softcover. 20 pages. G. Henle Verlag #HN119. Published by G. Henle Verlag"